Making plarn (or plastic yarn) from old plastic shopping bags is an easy process that can be done in a multitude of ways. I like to use the same method I use for making T-shirt yarn; for an alternative method check out Rain's plarn tutorial or the spiral cut option at the end of this tutorial. To start making your plarn, flatten the bag so that the side gussets are folded out and the sides are straight, forming a rectangle with the bag. Trim off the top of the bag where the handles are and the bottom seam of the bag. Cut the bag into strips, from one side edge to the other, leaving an inch or so of uncut space at the other side seam, as shown. It's a good idea to cut strips around half an inch to an inch wide, but you can certainly just eyeball them. It's unlikely you'll get all the cuts perfectly straight anyway, and there's no need to fret if you don't. Unfold the bag and open it up so that the uncut portion of the bag is in a single layer. 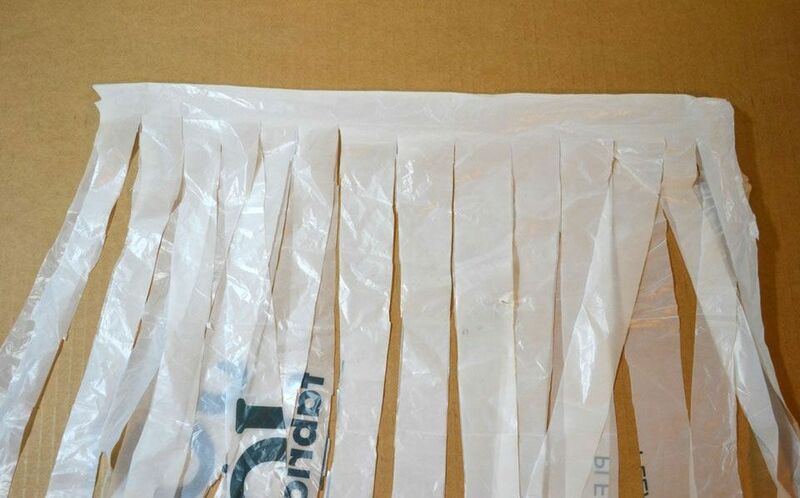 To cut the bag so that your plastic yarn comes out in one continuous strip, start by cutting the space between the first loop and the second loop at an angle, such that you're cutting from the top edge of the first loop to the top edge of the second loop, as shown in the photo. The rest of the cuts will be more straight across. Continue in this manner until you've worked all the way around the bag. At the beginning and end of the bag, you'll end up with additional loops hanging off the strand rather than straight pieces after you've done the cutting described in step two. You can either trim these pieces at an angle to cut the loop open or just trim the loop off. You lose a little length that way but it isn't a big loss if you cut off a little here (or ever accidentally cut the plarn in such a way that it breaks the continuous strand). For the spiral cutting method of making plastic yarn, as before, you'll trim off the top and bottom of the bag. Working with the bag in a single layer rather than cutting through both layers, pick a point (such as along one of the side seams) to cut down into the bag to the depth that you want the width of your yarn to be, then begin cutting around the bag, cutting and spiraling down as you go. Pay attention as you work your way around the bag, and if it ever looks like you're about to cut the strip so it will no longer be attached to the bag, just cut at an angle to give yourself more room to work. Of course, it's not the end of the world if you do cut the yarn off from the bag before you've reached the end; you'll just have a couple of shorter lengths to work with rather than one piece as long as the whole bag. While cutting the bag in this manner, you might find it easier to work with the bag over your knee so that you can be assured you're only cutting through one layer at a time. I found this to be faster than cutting while holding the bag in my hand or on a table. Whichever method of plarn making you choose, wind your strand of plastic yarn into a ball when you're done and you'll be ready to knit or otherwise craft with it. I made a plarn coupon pouch, while Amy made a crocheted pouch and Rain has a roundup of great ideas for using plarn in accessories. And if you have more bags than you have ideas for using plastic yarn, check out her other ideas for reusing plastic bags.